U.S. and Iraqi forces killed the two top al Qaeda figures in the country in a nighttime rocket attack on a safe house near Saddam Hussein's hometown of Tikrit, both countries said Monday, hailing the attack as a significant blow to the insurgency. Al Qaeda in Iraq has remained a potent force, seeking recently to sow chaos after the March 7 elections and ahead of a planned U.S. troop withdrawal. The terror group has shown a remarkable ability to change tactics and adapt despite repeated blows to its leadership. Iraqi Prime Minister Nouri al-Maliki announced the killings of Abu Omar al-Baghdadi and Abu Ayyub al-Masri at a news conference in Baghdad and showed reporters photographs of their bloody corpses. The deaths were later confirmed by U.S. military officials. The Iraqi leader said ground forces surrounded a house and used rockets to kill the two, who were hiding inside. The U.S. military said an American helicopter crashed during the assault, killing one U.S. soldier. In Washington, Vice President Joe Biden hailed the killings as a "potentially devastating" blow to al Qaeda and an "important milestone" in Iraq. "The future of Iraq will not be shaped by those who seek to destroy the country," Biden said. Biden said that Iraqis led the operation based on intelligence that Iraqi security forces had gathered themselves. U.S. forces commander Gen. Raymond Odierno praised the operation. "The death of these terrorists is potentially the most significant blow to al Qaeda in Iraq since the beginning of the insurgency," he said. "There is still work to do but this is a significant step forward in ridding Iraq of terrorists." In Washington, Pentagon spokesman Bryan Whitman said the operation targeting the two leaders showed the growing capability of Iraqi security forces. U.S. military officials have been highlighting the role of Iraqi security forces in the country as a way to demonstrate their ability to take over security as American forces draw down. Under a plan by President Barack Obama, all combat forces will be out of Iraq by the end of August, leaving about 50,000 U.S. forces in the country for such roles as trainers and support personnel. 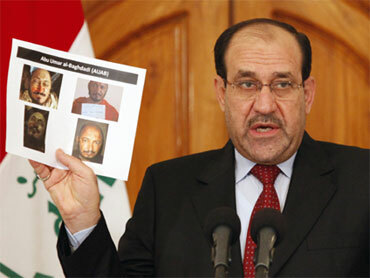 Al-Maliki described the deaths as "a quality blow breaking the back of al Qaeda." Al-Masri was the shadowy national leader of al Qaeda in Iraq, which he took over after its Jordanian-born founder, Abu Musab al-Zarqawi, was killed in a June 2006 U.S. airstrike. Al-Masri's real name was Abdul-Monim al-Badawi, according to a 2009 al Qaeda statement describing the makeup of a new "War Cabinet." Al Qaeda in Iraq emerged after al-Zarqawi pledged his allegiance to Osama bin Laden, leader of the global al Qaeda network, in October 2004. It has survived a series of setbacks in recent years. At its height, the group was able to inflame sectarian violence so intense that some described it as a civil war. Though al Qaeda has shown it is still capable of staging its hallmark coordinated suicide attacks against high-profile targets in the heart of the capital, U.S. and Iraqi military operations have diminished its power since the height of the violence several years ago. A revolt against al Qaeda by Sunni Arab tribes in Western Iraq in late 2006 and 2007 deprived the group of its main bases of support. Taking advantage of the vulnerability, the U.S. pummeled the group during the 2007 troop surge. Al Qaeda in Iraq has been led primarily by foreigners, but Iraqis form its backbone. At its height, it was estimated at close to 10,000 fighters but it is believed to have dropped off in recent years. Al-Masri, an Egyptian, kept a lower public profile than al-Zarqawi, who appeared in militant videos on the Web including one in which he personally beheaded American Nicholas Berg. The deaths are a significant boost for al-Maliki, who has staked his reputation on being the man who can restore stability to Iraq after years of bloodshed. The news came as Iraq's election commission announced it would recount ballots cast in Baghdad in the March 7 election, after al-Maliki's State of Law coalition raised accusations of fraud and irregularities in the capital as well as four other provinces. Al-Maliki's coalition is currently trailing one led by a secular challenger, Ayad Allawi, and the recount could potentially give the Iraqi prime minister the lead.